Sometimes I look in my fridge and think, “Why is there nothing to eat! 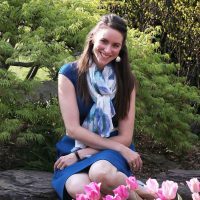 ?” As I am staring at the shelves piled high with perfectly good food, nothing seems like it would come together quickly, and none of my produce and dairy products and leftovers seem even remotely able to work together. Earlier this week when I found myself facing just such a dilemma, I forbade myself to eat cereal for dinner and reluctantly pulled some of my CSA goodies out and set them on the counter. So let’s talk about winging it. Because the perfect recipe isn’t always sitting right in front of you! The key to winging it is thinking back to what you have made and liked in the past. We are smack dab in the middle of fall, so of course we need to use up some fall squash. I love squash roasted, with a little bit of spice, tossed into a grain or green salad, with a hefty dose of yummy cheese. How do you like your squash? Maybe stuffed? or turned into soup? or sliced and sautéed? The beautiful thing about cooking is that you don’t have to stress over the proportions the same way you must with baking. You can tinker with it until it works! Just rely on familiar methods, add things you know you like, and everything will work out fine! Okay, so I knew I was starting out with roasted squash. I also had a bunch of kale and some last cherry tomatoes sitting on the counter. 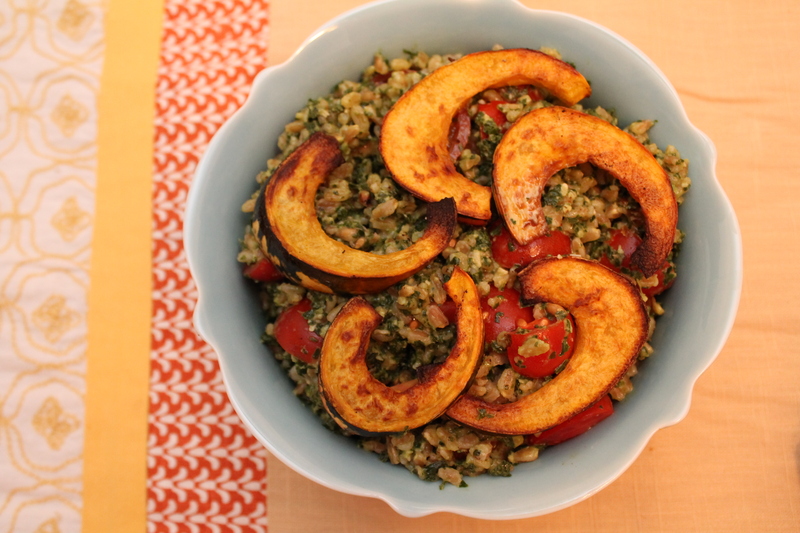 My loose plan was to roast the squash in thin slices, cook up some farro, make a pesto out of the kale, and stir everything together. I cut the squash in half through the stem and cut out the tough stem parts. I scooped out the seeds and then cut the squash into (mostly) even slices. After I was halfway through, I realized that the squash slices were shaped a bit like shrimp. Don’t you think they look like shrimp? That got my mind spinning. Maybe I should do a little squash cocktail, with the slices and pesto stuffed inside the whole other half! I briefly waffled back and forth about this. After all, I was already boiling the farro, and it didn’t really fit into this new plan (nor did squash cocktail seem like a complete dinner). But I went ahead with the squash cocktail idea anyway. And: wow. So glad I did! Back to the squash. I decided to leave the second half in tact so I could stuff it. So I tossed all of the slices with olive oil, salt, and pepper. Then I sprinkled them lightly with cayenne. 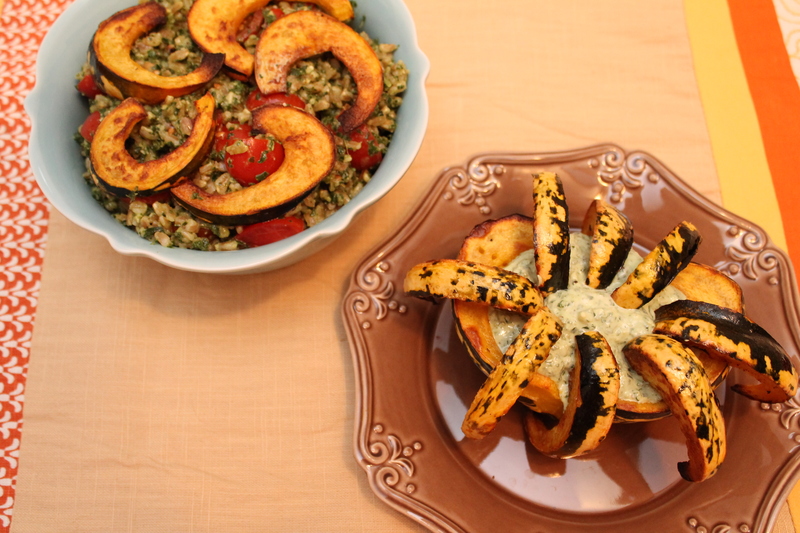 Because a little spicy goes so well with the sweetness of the fall squash! Rub the cavity of the squash half with olive oil and season lightly with salt and pepper. It might help to cut a little slice off the bottom of the half, that way it will sit upright. Roast the squash all together for 30 minutes at 400°. Turn the slices after about 20 minutes. Remember that they will brown on the bottom, so don’t let them burn! When they are done, they will be nice and crispy, almost like fries. Yum. Meanwhile, blanch about 4 cups worth of chopped kale. Make sure you remove the tough stems! 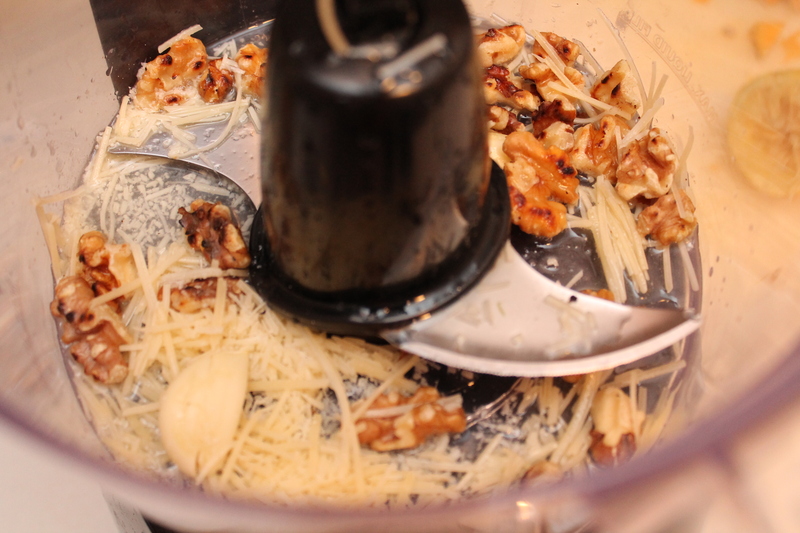 Pulse toasted walnuts, garlic, shredded parmesan, and lemon juice in a food processor until the nuts are finely ground. Squeeze the kale dry, then add it into the food processor with a splash of water. Turn the processor on and run until the kale is well broken up. 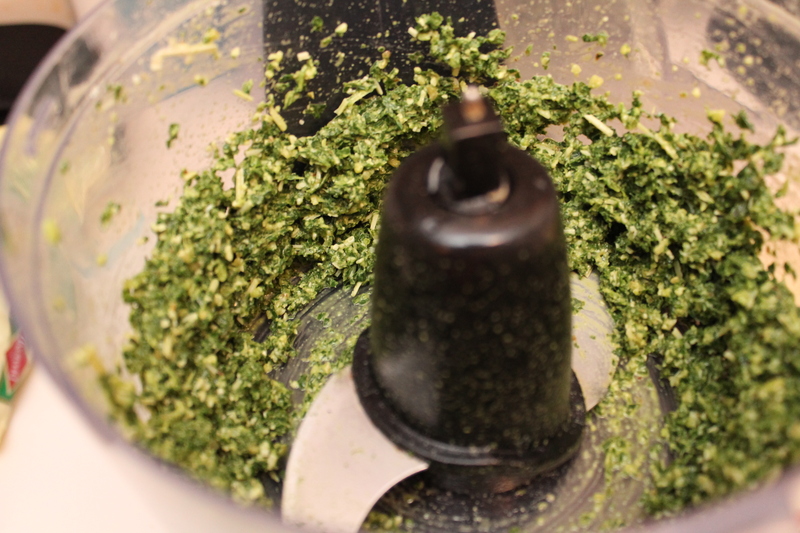 Stream olive oil into the food processor while it’s running, until the pesto reaches a thick but spreadable consistency. Season it to taste with salt and pepper. 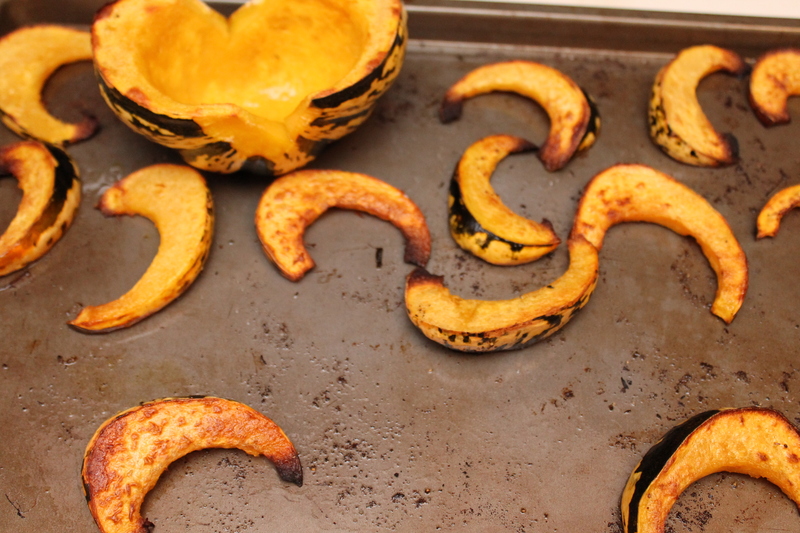 When the squash comes out of the oven, everything will come together really quickly. Halve the squash through the stem and cut out the woody bits. Scrape out all the seeds and pulp with a spoon and discard. Slice one half of the squash into long, thin wedges. Cut a thin sliver off the back of the remaining squash half so it will stand up. Set the squash on a cookie sheet. Season the slices and the inside of the squash half with olive oil, salt and pepper. Sprinkle cayenne over the slices. Roast in the oven for 30 minutes, turning the slices halfway. 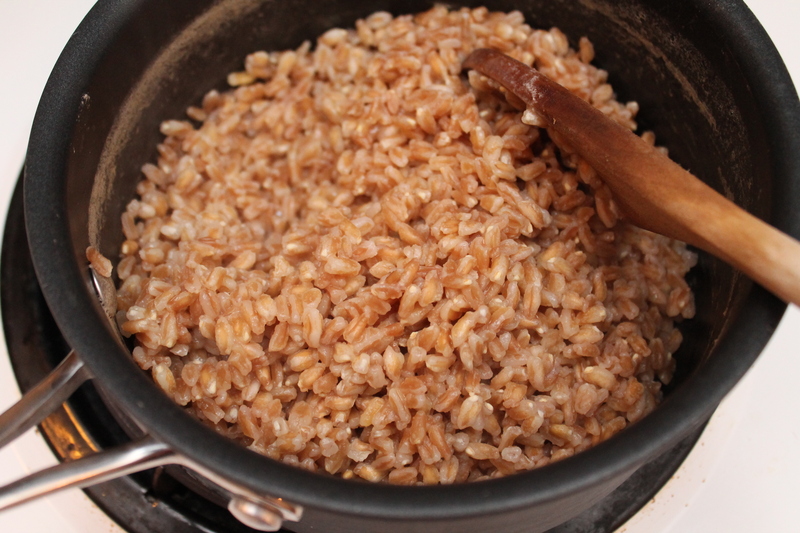 The skin and edges should be crisp when done, while the centers will be soft. 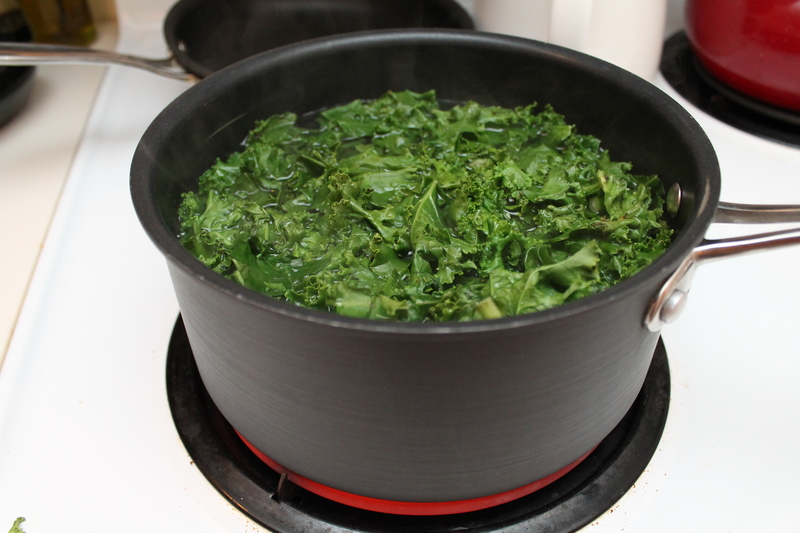 Meanwhile, blanch the kale in boiling water for 1 minute and 30 seconds. Immediately remove from the hot pan and plunge into cold water to stop it cooking. Pulse the walnuts, parmesan, garlic, and lemon juice until fine and even. Squeeze out the kale thoroughly and add it to the food processor with 2 tbsp. water and salt and pepper to taste. Turn on the food processor and drizzle in the oil. The consistency should be thick but smooth. 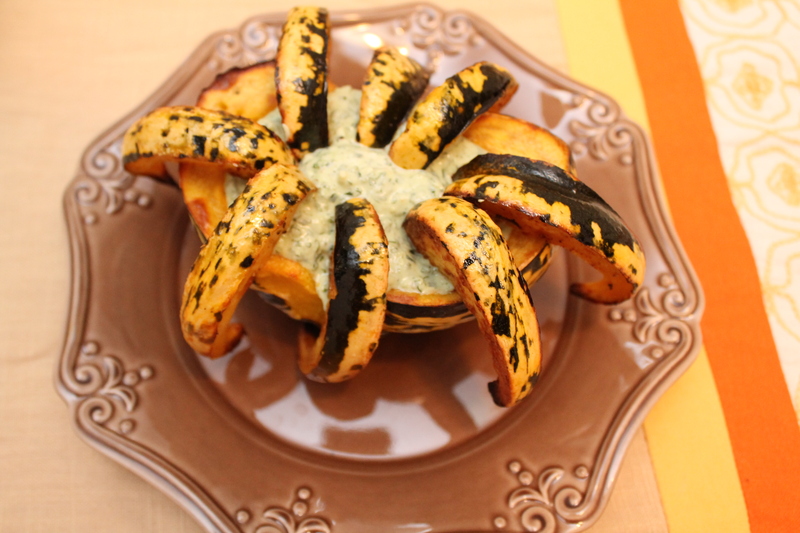 When the squash comes out of the oven, fill the squash bowl with the pesto yogurt. 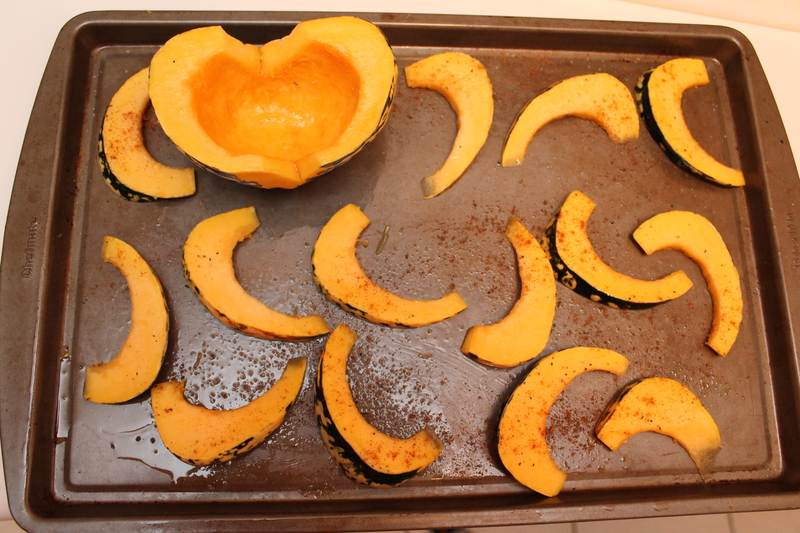 Arrange the slices around the edge of the squash bowl.